The purpose of this blog is to provide information about the last film based spy satellite program that launched 19 vehicles in a polar orbit around the earth between 1971 and 1986. It was a key asset that helped keep the peace during the cold war. It was considered the most complicated satellite ever put in orbit and allowed President Nixon to sign the first SALT Treaty and permitted President Reagan to say "Trust but Verify." It did the photographing of military assets of denied territories. The program was declassified in 2011. In addition to discussing the development of Hexagon, its importance, some imagery photographs Hexagon took of some Soviet assets, the blog will discuss some recently declassified information about it. Other topics will eventually discuss security, technical data, photographs of and personal memories by some participants at the company that created and built the camera system, the Perkin-Elmer Corporation in Danbury, Connecticut. Sign up to receive notifications when a new blog post is added. We respect your privacy. Your email will never be shared and you can unsubscribe at any time. Jun 7, 2017 Car or van pooling back in 1972 to save on driving and gas. Notice the ties. Jan 25, 2019 A fascinating look at the performance of the F-35 fighter jet. May 10, 2017 What Was Hexagon KH-9? Phil Pressel worked for the Perkin-Elmer Corporation in Danbury, Connecticut. He was the project engineer responsible for the design of the Optical Bars, which were the actual opto-mechanical cameras that captured the images that provided vital intelligence to the U.S. government during the Cold War. Phil is a published author. 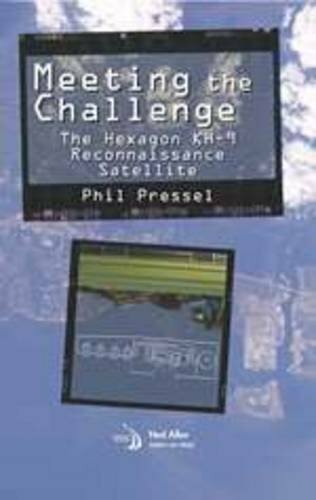 For the complete Hexagon KH-9 story, read "Meeting the Challenge: The Hexagon KH-9 Reconnaissance Satellite." He is a sought after speaker, and was interviewed on CNN's "Declassified."